Salted Caramel and Lucuma flavour ice cream with fruit extracts and sweeteners from natural sources. 38 calories per scoop. Great taste 2016. Sugar wise. Certified reduced sugar. Healthy food and drink awards 2016 winner. Vegetarian Society approved. Ever find your heart and head wanting opposite things? Us too. We're two brothers who made it our mission to create temptation you never need to resist. The result: a decadent ice cream full of flavour and high-quality ingredients, without loads of sugar and calories. Oppo is made with fresh milk from meadow-grazed cows free to roam and eat naturally. Enjoy some #GoodTemptation. 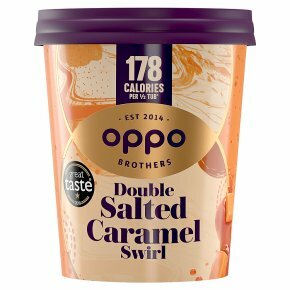 Lucuma gives Oppo Salted Caramel a smooth maple taste, quickly chased by a rounded caramel flavour which is enhanced with a pinch of rich mineral sea-salt. Magic.